I always have the best experience whenever I shopped there. They have cosmetic brands that we don't have here, and they always have Discounts (PLUS EXTRA loyalty discount! ), plus they always have FREE WORLDWIDE SHIPPING too! And they ship fast! Pfiuh, those are enough reasons to go shopping at Strawberry.net, right? They ship from their HQ in Hongkong and my order usually came in a week or less! Fast free shipping is one thing you rarely get nowadays. Anyway, I was actually just browsing around Strawberry.net, looking for their new weekly updated stuffs. 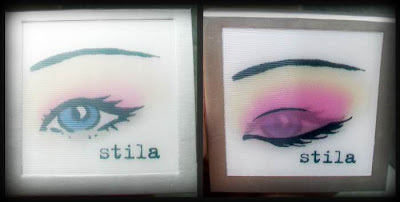 That's when I saw a Stila Lovely Eye Talking Palette with discounted price which has unique 3D palette design. And then I also saw a cute Too Faced cheek blush in the most gorgeous vintage pin-up girl box! I'm a sucker for cute packaging, sometimes I buy stuff just because they have cute packaging (duh!). So I was putting them in my shopping cart but wasn't really sure to buy them right then because I was having another plan to buy a NYX eye shadow palette and some Victoria's Secret body splashes from a local online store too, and I don't want to spend so much money on cosmetics since I already spent the most of my monthly budget on clothes. BUT....then I read their newsletter email which said that they are offering a Free Calvin Klein lipgloss for every purchase more than $25 during Eid Al Fitr celebration! And that what sold it to me! Stile pastel eyeshadow with unique 3D packaging. There's an eye graphic in front of the palette which can change into a closed & open eyelid if you hold the palette in different ways. Too Faced "Papa Don't Peach" Blush in Rouge. FINAL TOTAL : IDR 274.267 + Free Calvin Klein lipgloss ! woah too faced blush looks really sweet!